Rolling Meadows Sacred Heart of Mary "Sabres"
Courtesy of "A History of Offices, Agencies, & Institutions of the Archdiocese of Chicago"
Rolling Meadows (population: 25,000) is located in Cook County, 24 miles northwest of downtown Chicago in the northeastern part of Illinois. The community is nestled among several landmarks, among them the Arlington Park Race Track, the Northwest Tollway (Interstate 90), the newer North-South Tollway (Interstate 355), Illinois Routes 53 & 62, along with US 14. As a city, Rolling Meadows was settled in 1836 by Orrin Ford by staking a claim to 160 acres of forest and sprawling land near Salt Creek. Others that came from Vermont also decided to stay and built homes as the area grew and became part of Palatine Township by 1850. The area received a big boost in 1927 when H.D. (Curly) Brown bought 1,000 acres intended for a golf course and a racetrack, which later became Arlington Park. The golf course was never developed, so in 1950, Kimball Hill bought that land and started selling lots for homes with a floor plan in the Chicago Tribune. This did not bode well with the townspeople of Arlington Heights, who also had their eyes on buying the land, but zoning changes made by the Cook County Board appeased all parties in order for the Hill group to continue selling. Hill is the person responsible for naming the community Rolling Meadows in 1953 as the first families moved into the newly developed area. With each home sold, Hill donated $200.00 for each house sold to help start a school system. In addition, Hill created a homeowners' association, donated land for parks, and funded the Clearbrook Center, a home for the mentally handicapped. The community was incorporated in 1955, and was annexing more land for further development. At that time, Hill's company was building about 20 houses per week, which translated into 700 new homes in 1955. Seeing a need for need for a Catholic high school for girls in the northwestern suburbs, the Archdiocese of Chicago contacted the Religious of the Sacred Heart of Mary (RSHM) order about staffing a school in the late 1950's. According to a 1990 dissertation written by George Fornero about archdiocese high schools between the years 1955-80 (The Expansion and Decline of Enrollment and Facilities of Secondary Schools in the Archdiocese of Chicago, 1955-1980: A Historical Study), the sisters agreed on the condition that they could also staff a Catholic grade school in Rolling Meadows that would be adjacent to the girls' high school, which the Archdiocese gave its blessing. The grade school, which was named St. Collette's, opened in 1960. Originally, the school was to open in the fall of 1965, but the date was moved up to 1961 on behalf of the Archdiocese. When the school first opened on September 5th, 1961 at neighboring St. Viator High School, 138 girls were enrolled at Sacred Heart of Mary. 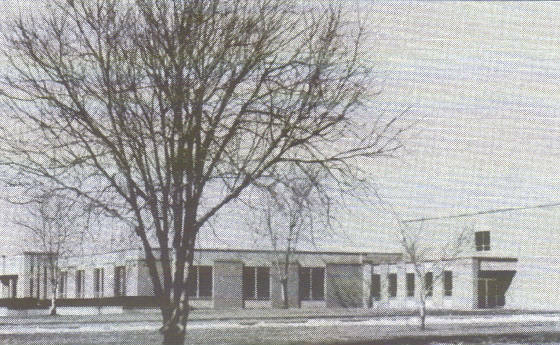 Two years later in September 1963, the new building opened at 2900 Central Road. The first graduating class was presented in 1964-65 when 782 students were enrolled, a total that would peak at 1,025 in 1967-68. The school was in financial crisis during the course of its lifetime, due to the debt on the building that was incurred by the RSHM community. A merger with St. Viator was first discussed as early as 1968, as the two schools shared building space, presented an annual musical, had educational & social programs and activities, had families with students in both schools, and a commitment to providing a quality college prep education with Gospel values. In 1972, the order deeded the school and mounting debt to the Archdiocese, which enabled them to concentrate on educating the young ladies of the Northwest Suburbs. After years of talking about merging, Sacred Heart of Mary and St. Viator finally brought all the students, faculty, families, and religious orders together in the fall of 1987 to become a co-educational institution. The Sacred Heart of Mary building was sold to Clearbrook in August 1987, who then sold it to Palatine Elementary School District 15. The building is still used for educational purposes as the John G. Conyers Learning Academy, which houses various programs for at-risk students, early intervention, early childhood special education, and special needs. As we gathered information about Sacred Heart of Mary, we found that swimming was offered at the interscholastic level, but no other sports or activities were found on the IHSA website (www.ihsa.org). Musicals were offered at the school as a joint effort with St. Viator as mentioned above, but there certainly had to be other activities that the girls were involved in. See the bottom of this page to find out how you can help us find out more. Sacred Heart of Mary's girls liked being in the water during the 1970's, and brought home a couple of individual medals from the state finals as those swimmers placed in the top six of their events. Memories from Chris Takata: "A friend of mine sent me this link while creeping on my past swimming times. Brought back memories. I only attended Sacred Heart Freshman and Sophomore years (1975-1977). After that I went to Arlington High School in Arlington Heights. I was a freshman when I took 6th in state swimming for Sacred Heart. "Back then we used to work out at St. Viator's High School. The pool was so gross...you could dive to the bottom and carve your initials in the scum on the bottom of the pool. Our coach was a very sweet lady. She was young. I think her name was Peggy...but I could be wrong." "Sacred Heart of Mary was an all-female high school. I believe we used the Lion as our mascot. I think most of our sporting events were against other catholic girl's high schools in the area. Thank you for including our school on this website. I have also forwarded your website to other alumni who may remember more details than I do. "SHM was a small school, but it also was a great school. We received a well-rounded education and had a great time. Our uniform colors were blue and white. We had a junior ring ceremony where we received our class rings. We also took a junior trip where we took three buses to visit Gettysburg, Williamsburg, and New York City. I THINK I SEE A NUN. HOLD UP YOUR BOTTLES & RUN. IN THE CELLARS OF OLD SHM!" "I was in the class of 1972, after first attending St. Colette Grade School in Rolling Meadows. Our freshman year, 1968-69 we had a rather large class, but after that year, tuition spiked to $500.00 a year and the parents of quite a few girls opted to send them to Forest View (Rolling Meadows High wasn't finished yet), Arlington, Prospect, or other surrounding public high schools. "We were taught by the Religious of the Sacred Heart of Mary, their signatures always included, the "RSHM" distinction, which in our youth and hilarity we deemed to stand for, Russian spy, Hitler's mother. We were young, it was the 60's. These wonderfully dedicated women were fore runners in the modernization of the Catholic church, eschewing their habits in 1970, along with abolishing our dress code. "There was an "optional" uniform available, which was brown herringbone in a small, chevron design, entirely different from our blue skirts and navy sweaters (with white blouses underneath the sweater, closed at the neck with stylish, monogrammed, gold circle pins). They instituted modular scheduling, even had independent study courses designed to expand our education and break from the traditional, Catholic, ruler-wielding atmosphere we were accustomed to. Many parents, mine in particular, HATED the new, modern approach and resented the high tuition and seemingly lacksidasical programs. More student decline resulted. "As far as sports were concerned, SHM participated in the GAA, Girls' Athletic Association in basketball and volleyball, fielding varsity teams in both sports. We traveled to Chicago, Des Plaines, and surrounding areas to participate, playing against other all-girls teams. "At the time of my graduation, there were only about 600 girls attending this school. "I go to Sacred Heart, oh pity me. There's not a boy in the vicinity. At nine o'clock they lock and bolt the doors. I don't know what the hell I came here for. we're gonna turn this damn town upside down.